Wish lists, or should I say registries are getting more creative, unconventional and modern, to keep up with the times, which are beyond the traditional registries. Unconventional registries may be a little controversial - telling people specifically the type of gifts you want. But why not? If you don’t want to end up with appliances you already own, then it makes sense to ask for gifts that you really want. With MyRegistry, you now have a registry that fit your lifestyle or need. MyRegistry.com a premier universal gift registry that enables all stores, for all occasion on one registry. So if you are the couple who’s walking down the aisle, the expecting parents, or even the non-profit looking to raise funds, you can create your dream online wish list. MyRegistry is the perfect online wish list to help overcome the one-store limitation. Just drag and add the MyRegistry button to your bookmarks bar, so when you surf the web you can easily add items from any store to your master list. You can even include things from that local boutique you like, Etsy, or even make your registry more male-centric to cater to your groom. You can setup a cash gift fund, to tastefully request cash from your family and friends, to crowd fund things like your honeymoon, the perfect nursery, or even a down payment on the new home. Already have several registries? No problem! 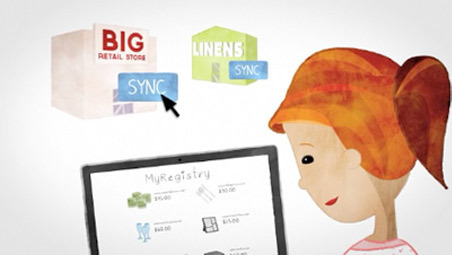 MyRegistry unifies them all into one master list for easy management. Whether you are creating a wedding registry or a baby registry, they have additional features including stores and idea boards to help plan your wedding or prepare for the arrival of your newborn. Are you a non-profit or organization looking to run a fundraiser? There are many ways to use MyRegistry to suit your organization's needs. Create a gift or wish list to help raise funds, which even let your donors choose the initiatives they would like their contributions to fund. Announce your registry by sending beautiful printed cards or ecards, display wish list on your website, or you can also easily share on social media using your personalized url. Add products on the go, by scanning the barcode using your smartphone, which also allows you to do price comparisons for the best prices. MyRegistry even have a concierge team waiting via phone or online to grant personalized service to you or your guests. Ready to create your registry? Sign up it’s FREE! This post includes affiliate links that may yield a commission.